Earlier in the day, BJP spokesperson Sambit Patra had said that the law ensure that absconders like Vijay Mallya are brought to justice was brought by the NDA government. The Congress on Saturday lashed out at the BJP over the ruling party's claim that it had acted against economic offenders like Vijay Mallya, saying the Centre is trying to claim the credit for everything, as if those happened only after it assumed office in 2014. "If BJP is taking credit for declaring Mallya a FEO (fugitive economic offender), then let them take credit as they are taking credit for everything from Mangalyaan, Chandrayan, Pokhran one to Pokhran 2 (nuclear tests)...we should be celebrating India's 5th birthday on May 26, 2019," Congress spokesperson Pawan Khera told reporters. A special court in Mumbai on Saturday declared absconding liquor baron Vijay Mallya a fugitive economic offender on a plea of the Enforcement Directorate. "BJP feels that everything happened after its government came to power in 2014," Mr Khera added. Earlier in the day, BJP spokesperson Sambit Patra had said that the law ensure that absconders like Mallya are brought to justice was brought by the NDA government. Mr Khera also alleged that Mallya met Finance Minister Arun Jaitley and sought his permission before fleeing the country. "Mallya met a minister, sought his blessings and permission and left for London. I am sure they were getting updates on it. We all know...what happened and how it happened. In fact, a certain BJP minister recently even said that Mallya was not a fugitive and not committed any fraud. "When Mallya himself said that he left after meeting Arun Jaitley, sought his permission, so what else is there to say," said Congress spokesperson Khera. Mallya has become the first businessman to be declared an FEO under the provisions of the new Fugitive Economic Offenders Act which came into existence in August last year. The Enforcement Directorate (ED) had requested the Prevention of Money Laundering Act (PMLA) court that Mallya, who is currently in the UK, be declared a fugitive and his properties be confiscated and brought under the control of the Union government as per the provisions of the new FEO Act. 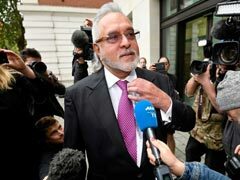 Special judge MS Azmi declared Mallya an FEO under Section 12 of the Act after hearing extensive arguments from the lawyer of Mallya and the ED counsel. Mallya, accused of defaulting on loan repayments and money laundering, had left India in March 2016.